Members of Pi Gamma Mu will take the nation's capital by storm this October when the 2011 triennial international convention occurs in the Washington, D. C., metropolitan area. The convention will begin on Thursday, Oct. 20, at the Holiday Inn National Airport Hotel in Arlington, Va., with several energetic activities that include our mock constitutional convention for the drafting of proposals to amend the U. S. Constitution. But on Friday, Oct. 21, we take the action right to the U. S. government itself, as we ride the Metrorail into the District of Columbia and meet in the offices of the U. S. Congress. In one of Congress's office buildings, some of our student members will present their research papers and posters, under the watchful eyes of members and employees of the legislative branch. 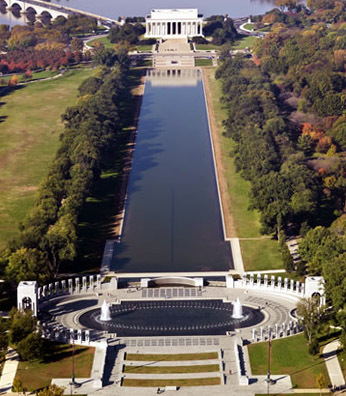 We'll even go on a tour of the National Mall. We have all of the information about the hotel, registration, and the program ready for you now, so that you can plan to attend. The call of the convention appears in a Microsoft Word document that can be accessed at http://organization.northgeorgia.edu/pigammu/ICOND.docx . You can start raising funds for travel subsidies now, and remember that every chapter that has submitted initiation fees over the past 3 years has a travel fund to help to pay for delegates' travel costs. Registration - the fee will be $18 per person, which must be received at headquarters by Monday, October 3. This fee includes the dessert bar on Friday evening, October 21. Tour - Delegates are invited to participate in a Tour of the Mall: "It's a Mall World After All" led by Secretary-Treasurer Larry Heck. If a student presents a poster, the poster must display (a) a summary of the research project, including the thesis statement or hypothesis, (b) an outline of the methodology and information discovered, and (c) the findings, including a statement of whether the thesis statement or hypothesis was supported or unsubstantiated. Service Project – We are asking delegates to bring a stuffed animal to the convention. It would be nice to have the toys indicate what state they are representing (e.g., holding a state flag or wearing a ribbon with the name of the state on it). We will pretend to have a national Constitutional Convention for the proposal of amendments to the U. S. Constitution. The toys will be collected and donated to a local battered women's shelter. One of the ideals of Pi Gamma Mu is Social Service, and we want to leave Washington, D.C. knowing that we were able to help some children. The nominating committee invites all chapters to submit names of candidates for a position on the Board of Trustees to appear on the 2011 ballot. Chapter participation is essential because the Pi Gamma Mu constitution states, “Each candidate whose name appears on the ballot must be nominated by a chapter.” Nominations for board members may be sent to headquarters. All nominations are to be made for the Board of Trustees. A chapter should not specify a position in its nomination. Positions to be filled for three-year terms are: president, first and second vice president, secretary-treasurer, and chancellors for each of the regions. Because of the distribution of this newsletter electronically using the Pi Gamma Mu Listserv, the international office is in regular contact with thousands of alumni/alumnae at a dynamic level of communication that we used to just dream about. This means that thousands of you are receiving this edition of the newsletter in which we invite our members to our triennial international convention this October in the Washington, D. C., metropolitan area. To our valued alumnus/alumna members: Please, won't you consider attending Pi Gamma Mu's 2011 international convention? Let's get to know each other again! Last month, President Obama signed into law an extension of the Bush-era tax cuts. In doing so, he broke a major campaign promise: ending the Bush tax cuts for the wealthiest Americans. In negotiating with GOP leaders, this is what Obama had to give up in order to obtain legislation that extended unemployment benefits and tax cuts for the rest of us who are not among the nation's richest. Thank You for Supporting Our Pi Gamma Mu International Membership Directory! I am delighted to hear reports that members have been receiving their copies of the magnificent "Pi Gamma Mu international membership directory" in the mail. Harris Connect has advised us that 86,067 members will be in the biographical, school, and geographical sections of the directory, and 179,622 members will be listed in the alphabetical section. Pi Gamma Mu at The University of Vermont started in 1932. See their Spring 2011 induction. Two Pi Gamma Mu members — Dr. Frances Staten, professor of sociology at Grambling State University and Pi Gamma Mu governor for Louisiana, and Dr. Alma Thornton, professor of sociology and director of the Center for Social Research at Southern University and A&M College — have initiated a Pi Gamma Mu International Honor Society Family Empowerment Scholarship campaign. Wilmington University's Delaware Beta Chapter inducted 104 new members last November. Nearly 300 people attended the event. The chapter was established in 2007 under the auspices of chapter advisor, Johanna Bishop. Membership is open to students who meet stringent academic requirements and agree to participate in service projects. Each member is supposed to contribute 10 hours of volunteer time to a cause or organization of their choice. During the annual meeting of the international Board of Trustees in October 2010, the board approved the recommendation of the Awards Committee concerning which chapters are recognized on this year’s Roll of Distinction and Roll of Merit. The Rolls are the result the Awards Committee's evaluation of the annual reports filed by responsible chapter officers. Among the criteria reported are facts indicative of the activity and effectiveness of the chapter on its campus, as well as its efficiency of operation according to procedures suggested or required by the international board. This includes chapter organization and participation by faculty membersand students, election and initiation of members, and financial responsibility. Local initiative in developing new activities or methods of operation is considered. These lists are in alphabetical order. DOES YOUR CHAPTER HAVE A BANNER? Our Pi Gamma Mu banners are very popular. These banners are great to use at your initiation ceremonies, and you can display them in a prominent spot to advertise your chapter. The banners are made of two thicknesses of heavy royal-blue nylon with white fringe on the top and bottom, a white cord and tassels with which to hang the banners, and our key-pin design screen printed in white. The banners come with a gold rod through the top. They are ready to hang on a wall, or over a podium. The new banners are 2 feet by 3 feet in size. The price is $75. Order one for your chapter soon. Honor cords available at the Pi Gamma Mu office. You can proudly wear these attractive royal blue and white cords at your graduation. The price of the cords is $15 each plus $2.95 for shipping and handling. Honor cords are our most popular item. Please plan ahead and order your honor cords early. Send your check and return mailing address to headquarters or call (620-221-3128) to give us a credit/debit card.